Phil Bonzon is building a 20' 4" X 15' 2" HO scale layout representing the BC&G and ERC&L, along with the B&O, in the late 1950's-early 1960's era. Phil has graciously agreed to share his project with us all via this website! Thanks, Phil! We'll eagerly watch the progress of this wonderful project! To see photos of each town on Phil's layout, click on the town names on the Navigation Bar above. 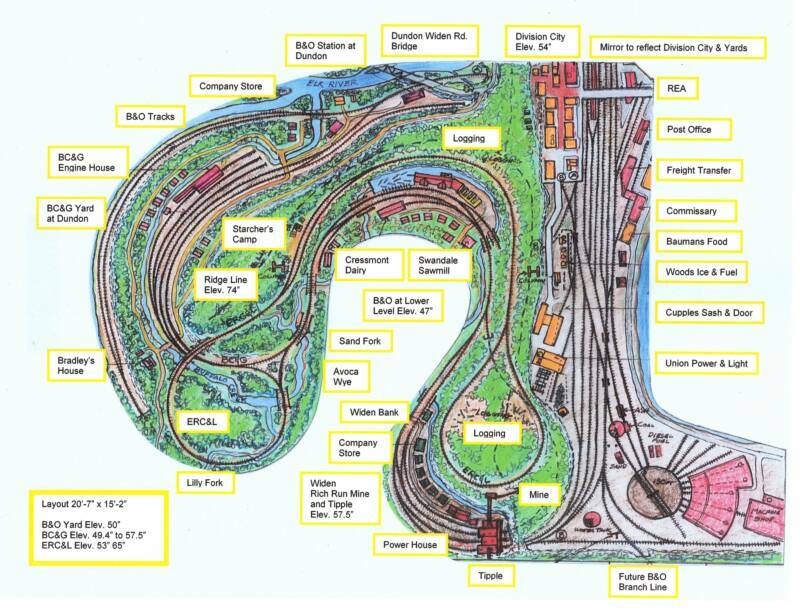 Below is a beautiful drawing of the layout plan that Phil has created. Below that, in his own words, is Phil's modeling concept and then several photos of completed portions of the layout. Phil has indicated he'd be glad to hear from anyone who would like to exchange information with him at PGBonzon@aol.com. "I am a long-time B&O fan and recently became interested in the BC&G through Deane Mellander's and Bob Kaplan's "B&O Steam Finale Volume 1". I thought the BC&G would be an ideal short-line to model with the B&O. As time passed the BC&G and ERC&L became the more dominate roads on my layout. Through the use of the intenet and topographical maps I have developed my HO layout plan that is 20' 7" x 15' 2". The time period is the late 1950s. Steam and diesels were both in use on the B&O. The layout is currently under construction, 300 feet of track has arrived and 50 of my 65 turnouts have arrived - Shinohara turnouts are a little hard to obtain. For the BC&G, I have modified two Bachmann 2-8-0s to resemble #4 and #13 and rebuilt a Tenshodo USRA 0-8-0 into a 2-8-0 to resemble #14. Also, I have built a B&O I-5 caboose (lettered for BC&G) and two BC&G hoppers. I am planning to build Railbus "A" and maybe Railbus "B". Since "coal was king", I currently have thirty-six hoppers, mostly B&O, and plan to add about twenty more. The BC&G will include Dundon (station, shops, company houses and store), Avoca wye, Sand Fork, Cressmont (dairy), Swandale (sawmill, engine house, company store and houses) and WIden (mine, tipple, power house, Widen bank, company store & houses). My ERC&L equipment is labeled WM RITTER because of the time period. At present, I have a 3-truck Shay #19 and a 2-truck Climax #3. 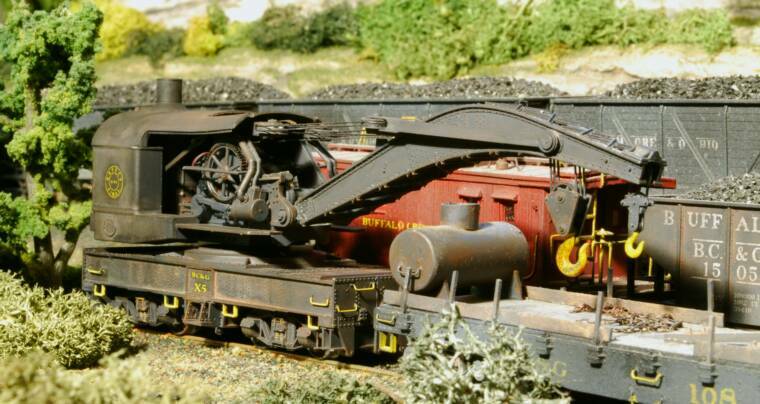 I have built five flat cars, an American Log Loader from photographs/drawings and a 4-wheel wooden caboose. The ERC&L will join the BC&G at the Avoca wye and will include the Lilly Fork. Unlike the actual railroad, I have doubled back the ERC&L over the BC&G instead of following the LIlly Fork valley because of space limitations. The vertical separation between the two railroads will vary from 4" were they cross to 7" at Swandale and 8" at Widen. At Widen the ERC&L track will be at eye level. The B&O starts and ends at Division City. It passes by Dundon and the Elk River, enters a tunnel and continues on a lower level below the BC&G, reemerging through tunnels into Division City. Its plan is a simple "L" shaped oval with passing sidings and two reversing loops. The B&O is planned to expand into another room where Kanawha City, with an industrial switching area, and Strange Creek, with another coal mine and a paper mill, will be located. Also, a wye is planned for the B&O tracks below Widen that will lead to B&O staging tracks. Since I cannot exactly replicate the BC&G and ERC&L, my goal is to capture their character and surroundings and bring them back alive through my layout. As research tells me more about the BC&G, if possible, I plan to incorporate that knowledge into my layout. When I found Dundon B&O station photos, for example, I built a new station model and replaced the one that I had built previously. When photos of Bower's Coal Sales and the stairway by the Dundon station were found, I built models of them and added them to my layout. The layout will be a never-ending project and hopefully, a constantly improving one. DIVISION CITY - Phil's considerable structure modeling skills are evident in this photo of the finished section of Division City. Here are BC&G #4 (left foreground), #14 (right foreground) and #13 (rear) together for a rare roster photo near Dundon. 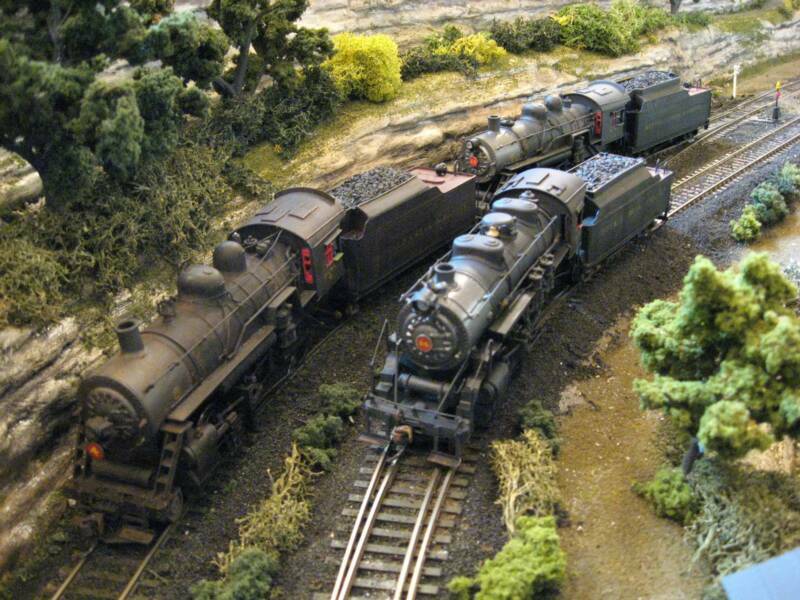 As is obvious by all the photos in this section on Phil's layout, his modeling skills are exceptional. I've followed along as he has been building this layout and the models on it and I can attest to the fact that he not only builds beautiful models but he builds them very quickly! Coach #17 - Phil completely scratchbuilt this model of BC&G #17 using PRR drawings found here. 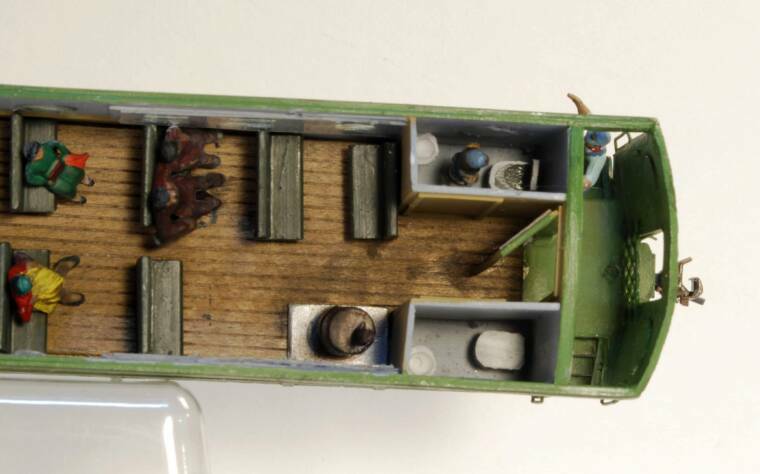 The model has a removeable roof and a completly detailed interior, including a crewman in the restroom (below)! Crane X-5 and Flat #108 - Phil modeled X-5 using a Tichy kit and modified a flat with the appropriate equipment to represent flat #108. 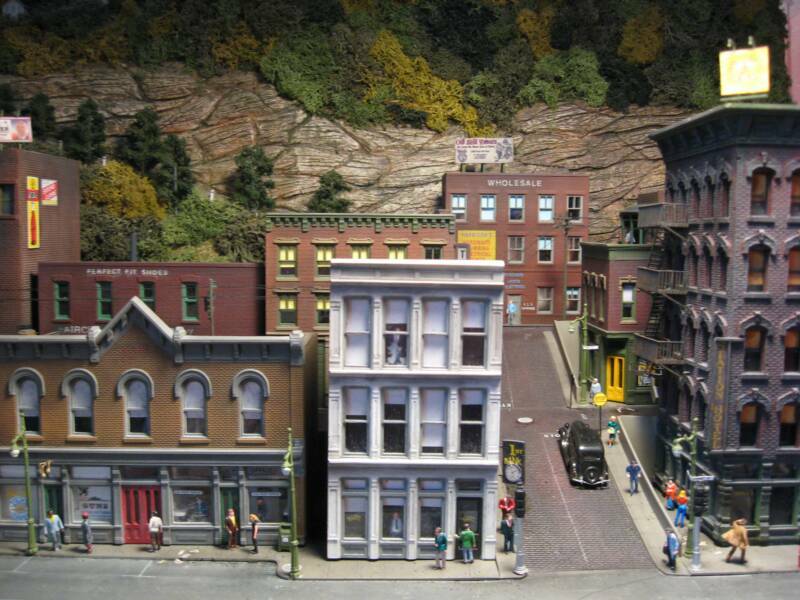 * In September 2009, Phil was certified as a Master Model Railroader (MMR) by the National Model Railroad Association. He became the 427th modeler to be so certified since the Achievement Program's inception 48 years ago.